President Barack Obama's job approval polling numbers went sharply up in August, after falling slightly in July for the first time this year. Obama has now seen gains in seven of the eight months of 2016, and August was the third-biggest of these jumps. Obama's job approval is now higher than every other month in his second term except the first one (January, 2013), putting his legacy in pretty good position with the public. The bounce upward can clearly be seen even in the large-scale chart. The major reason for this upward spike was, of course, the Democratic National Convention. The convention happened at the very end of July, meaning its impact wasn't reflected in the polls until the first week of August. Obama got a substantial convention bounce, but it seems to have crested in mid-month. His average monthly job approval stood at 51.3 percent, marking an impressive rise of 1.7 points. His average monthly job disapproval fell even further, down 1.8 points to 44.9 percent. This is rather remarkable for a number of reasons. After his first-term "honeymoon" period, Obama has only ever had higher job approval numbers during three months -- right before he was inaugurated for the second time, and a one-month blip when the death of Osama Bin Laden was announced. To put this another way, in his post-honeymoon presidency, this is the fourth best month Obama's ever had. That is nothing to sneeze at, folks. If Obama manages to improve another point and a half in the months he has left, he'll hit the highest point he's seen for his entire second term. Alternatively, this could all be a temporary convention bounce which might taper off soon. The next two months will be focused on the presidential race, of course. Obama is going to be out on the campaign trail for Hillary Clinton during this period, which will allow him to fully voice his political take on things. He's said to be scheduling appearances in swing states right before the deadline to register to vote, so his campaigning will have a heavy "get out the vote" flavor to it. Congress will slouch back into town briefly in September, but they likely won't get much done (unless you count a lot of political posturing), and they'll all flee back to the campaign trail soon enough. So it's not very likely there will be any sort of protracted battle between Congress and President Obama during the upcoming month. If you just look at the monthly trendline, Obama is surging upwards once again at a significant pace, continuing a total climb of 7.6 percent since the beginning of the year. His disapproval number hasn't fallen quite as fast, due to a lower percent of undecided voters now. Still, disapproval has now fallen below 45 percent, which is a pretty good place for it to be for any president. You can see Obama's entire second term in this more-dramatic graph which better shows the month-to-month changes. That is quite a turnaround from last December. But the trendline might be misleading. While Obama posted a large gain in August, his job approval rating is likely going to remain pretty flat in September, as the convention bounce dissipates a bit. This trend only shows up when you look at the daily rolling average numbers. Obama started August in better shape than he spent most of July, at exactly 50.0 percent. 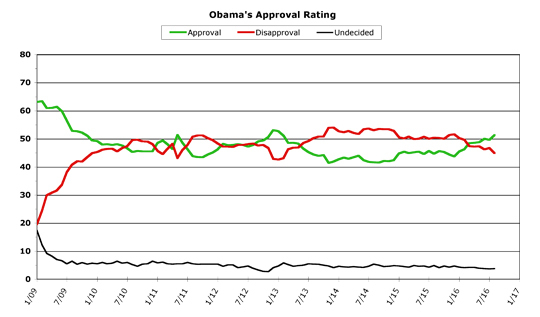 This climbed sharply to a peak of 51.9 percent, where Obama spent a total of five days mid-month. But then it slowly receded, down to 51.0 percent and then back up to only 51.4 percent by the end of the month -- only 0.1 percent higher than his monthly average. This usually indicates a flattening, which will likely take place in September. Obama's job disapproval has more potential for improvement next month, as it is higher now than it has been when Obama's approval rating was previously above 51 percent. Right now, 3.8 percent of people polled are undecided, which is an extremely low number (a more normal range is between 5 and 6 percent). This is why I would expect Obama's job disapproval rating to go down at a faster pace than his approval goes up for the next few months, as more people move to at least giving Obama the benefit of the doubt. You can see this on the expanded chart, if you compare the second month (February, 2013) with August's numbers. 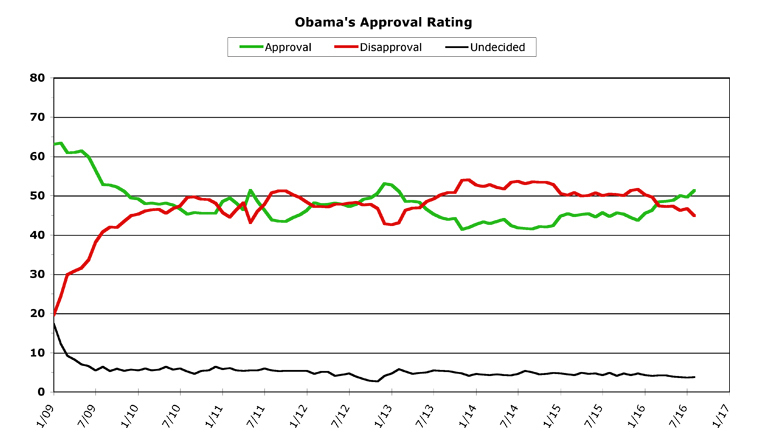 Obama was at 51.1 percent approval in February, 2013, and he's now at 51.3 percent. But his disapproval is currently at 44.9 percent, when back in February, 2013 it was almost two points lower, at 43.1 percent. What this all means is Obama's probably got room to improve his job disapproval rating, even if his job approval rating stays largely the same. This is what I see as most likely to happen in September. 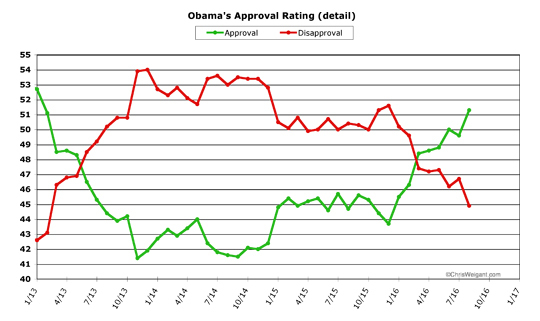 Obama may slightly improve his job approval rating, but nowhere near as dramatically as he did in August. He may hit a plateau, in fact, in job approval. But job disapproval still has room to improve, so I'd expect to see it fall faster than the approval number rises. Obama is more popular than either of the major candidates for president, and with them beating each other up on the campaign trail all month, I see nothing that would alter that public perception in any big way. When I look at the second graph, it's not hard to imagine that 51.3 is akin to inching toward 60! People are saying to themselves, "Apparently, Obama is the epitome of competence compared to Hillary.."